Chevrolet Lacetti PDF Workshop and Repair manuals, Wiring Diagrams, Spare Parts Catalogue, Fault codes free download! Chevrolet Lacetti – a compact car, created by the South Korean automaker GM Daewoo. At the moment, the car continues to be released in a sedan car in Uzbekistan and China. The release of the 5-door hatchback and 5-door station wagon is discontinued. The model replaced Daewoo Nubira. The design of the sedan and wagon was developed in the Italian studio Pininfarina, the hatchback design was created by the Italian studio Giorgetto Giugiaro. The car was introduced in the sedan car in Seoul in 2002, a year and a half later the hatchback was shown at the Frankfurt Motor Show, and the station wagon was on sale in 2004. In 2009 Chevrolet Lacetti and Chevrolet Cobalt of the first generation were replaced by a new model of the GM concern for all markets of the Chevrolet Cruze. The most sold model in China in 2012 (under the name of Buick Excelle). In 2014, it was withdrawn from production in Russia, in 2014 – in Uzbekistan. In return, they produce Daewoo Gentra, but for the domestic market of Uzbekistan the name Chevrolet Lacetti is used. In Russia, the car began to be sold in 2004, all three types of body were introduced. Cars with a 2-liter engine in Russia were not sold. In 2007, a special version of the WTCC street edition was launched, based on the WTCC championship, in which the sports Lacetti won prizes. This version differs from the serial version by the presence of a rear spoiler, sports kit, cast discs. Since 2013, Russia is being sold in an updated form as Daewoo Gentra (from 2015 under the Ravon brand). Assembling cars in a sedan car is made in Uzbekistan. 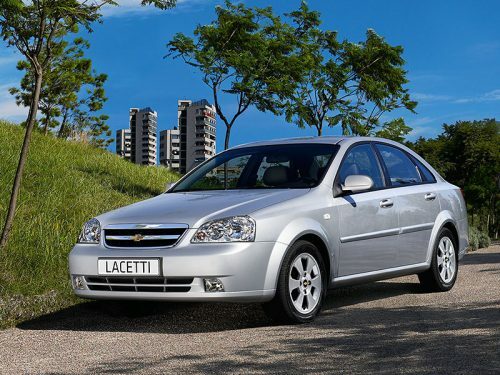 The assembly of Chevrolet Lacetti in Kaliningrad is discontinued. In Europe, the car was originally sold under the brand Daewoo, and only in 2004 was named Chevrolet. In some countries, under the name Lacetti, only the hatchback was sold, and the sedan and station wagon were called Nubira. In the US, the car sold under the brand Suzuki Forenza (sedan and wagon) and Suzuki Reno (hatchback), coming in 2004 to replace the model Daewoo Nubira. Forenza / Reno took the place between Aerio (later SX4) and Verona. The American model line included the 4-cylinder gasoline engine 2.0L E-TEC II, developed by Holden, which produces 126 hp. at 5600 rpm. In China, the car is sold under the brand Buick Excelle. In 2008, the sedan was restyled. In 2009, the production of the hatchback (Buick Excelle HRV) and the station wagon was discontinued. In Australia, the car was sold under the brand Holden Viva, in Asia, South America, as well as in Canada, Mexico and South Africa under the brand Chevrolet Optra.